This is an inquiry that follows the moment anyone is introduced to my full name. What I am really being asked is if I am in any way related to Kamran Lashari – my father, and arguably one of the most popular and respected bureaucrats in Pakistan, known for bringing innovation and zing to city development. Or perhaps they mean my eldest brother, Bilal Lashari, the country’s most successful and celebrated film director. Or do they mean Omar Lashari, my Cornell educated, financial analyst brother? Never could I muster up a compelling answer to this. After all, how could a high school student fall in the same league? I needed to earn my place in the family, which is why I was consumed with a maddening passion to achieve something. Determined to follow my heart and conquer the world, I knew what I had to do – start a rock band! Our band, Jhol, somewhat gained popularity in Lahore, the city I have lived in all my life. It had been a combined dream of the band to perform in the most celebrated music platform of the country, Coke Studio. However, we discontinued composing music after some of the members of the band became occupied with their personal lives. That being said, I was not ready to give up my passion. As an undergrad finance student in my final year and about to face the corporate world, I wanted to join a company that acknowledged my passion and challenged me to explore my creative side. A few months later, there I was, interning in the marketing department of The Coca-Cola Company in Pakistan. I was later offered a full-time position, and it took two years in different roles to finally be promoted to the creative lead for the company. My decision not to let go of my passion for music finally paid off – the company decided to make me in charge of Coke Studio’s seventh season! The four-and-a-half years I spent at Coca-Cola showed me that I had a knack for marketing; making me realise that marketing is what I had been doing all my life, even when I was a musician. If it wasn’t marketing a brand or a product, it was marketing my own songs! In that moment, I knew I had to build my fundamentals in this highly interesting field. I started my search for the perfect Master of Business Administration (MBA) program that would help me explore my marketing, creative and business strengths and provide me with a focused approach in terms of how to apply these strengths. After a lot of research and talking to alumni, one of whom was also a colleague at Coca-Cola, I selected the perfect university for me that specialised in marketing – HEC Paris. HEC is located just 12 miles from the centre of the French capital. The business school’s beautiful campus is surrounded by woodland, and is built around a 19th century Chateau, which is actually used for classes! The idyllic campus has lots of clubs to get involved in, and boasts a really vibrant student community. I knew that this environment would inspire me to learn, socialise and experience the European culture. Students are even encouraged to learn French during their studies. 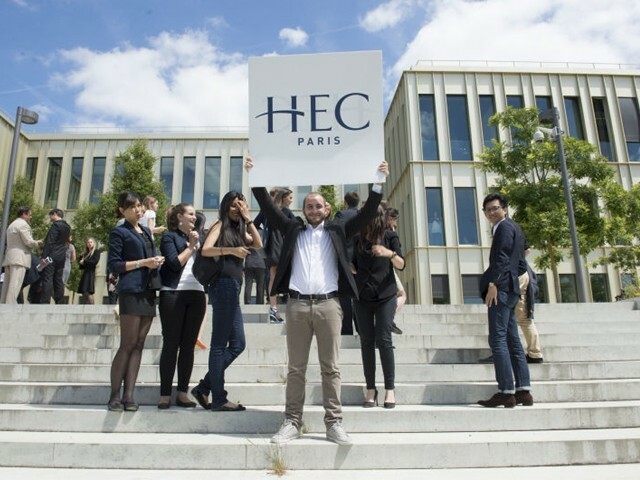 Apart from all the charms associated with being situated in the Parisian suburbs, HEC Paris is one of the most prestigious and selective business schools in the world. It is known for small, personal class sizes, and the ability to have specialised MBA programs in fields like finance, luxury and management. The business school and its impressive ranking credentials encouraged me to believe that travelling halfway across the world would be completely worth it. After all, HEC Paris is recognised around the globe. Studying here promised that I would cultivate my business know-how and increase opportunities internationally, which was exactly what I was looking for. Deep down, I knew that if I wanted to truly become a multi-cultural manager, I needed to broaden my horizons and leave Pakistan. I started my course on September 4, 2017, over four months ago, and it seems like it was only yesterday that I had my orientation week. With over 50 nationalities in my cohort, I could not have asked for a better international experience! Indian, Chinese, North or South American, Japanese, African, European – you name it, and HEC has it. Having lived in Pakistan my entire life, one can understand why I never had the opportunity to make an Indian friend. Now, I have more than 30 Indian buddies. To top it all off, after realising I am the only Pakistani in the cohort, they even added me in their all-Indian Whatsapp group! Moreover, the prestigious HEC Paris alumni network, which I now have access to, has nearly 4,000 graduates, who are currently either the chief executives of, or have founded their own companies. While I can go on forever about the brilliantly organised program and vast options of electives that HEC offers, I think the true learning and experience lies with the people you work and interact with. In these past months, I have met the most brilliant minds, worked with the most competent individuals, and made a few crazy friends along the way. And my journey here has just begun. I would advise all my fellow Pakistanis who have the option to study abroad to try your best to get as much international exposure as you can. The education system in Pakistan is brilliant and we have some top-ranking universities, however, I personally believe that if you really want to grow, you need to push yourself and experience cultures different from your own. To those who argue that academia is not the road to success, and throw a few examples of dropouts at your face, let me say, I agree with you. But while I agree that higher education might not be the only road to success, what you learn from people with entirely different mind-sets and backgrounds is priceless – you will never experience that living in your own culture and comfort zone. So, if you have the option to go out and study abroad for a few years, please do. Not only will it change the way you think, it will change your life. It definitely changed mine. The author is currently an MBA student at HEC Paris, and was formerly the Creative Strategist for Coca-Cola, Pakistan.